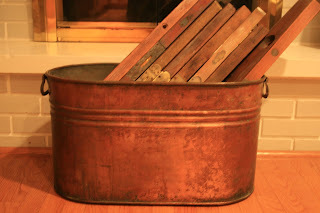 You are here: Home / Vintage Items / Auction Tomorrow….Copper Pot and Vintage Wood Levels…. So tomorrow is an auction about 40 minutes away in a small town…keep your fingers crossed for me and maybe I will have some great pics to post of my finds….might even try a mobile blog post…..until then here is a fun picture to pass the time…..because every woman needs a copper pot to store her vintage levels!! Copper pot-$10.00 from an auction..levels from an auction…ranged from $1.00 to $3.00 a piece…I think I will display them on a wall at some point…..I know they will be level!! Good luck at the auction, Chris! Love your copper pot…fabulous! The pot turned out awesome!! It will look so good this winter next to your fireplace! Can’t wait to see it in person!